Summary/The students will be asked and stimulated to look around there own universe, investigate their personal interests, their background. We will work with stories that happen or can be created around us everyday, to discover the possibilities to develop a personal photo project in our own “backyards”. Good histories and projects are everywhere it’s the photographer’s ability of seeing that counts. To do so, we will investigate the work of some landmark photographers that didn’t have to go away from home to work. We will see how they develop their projects, finding symbolism and great stories on everyday objects and the landscape around them. After that each student will be asked to work on a personal project during the two weeks of the course. We will analyze the work, investigate how light, the photographers approach to the subject, technical aspects, presentation and editing can help develop a strong body of work. Students are also welcome to bring their current portfolios and projects to share with the group and to be analyzed. 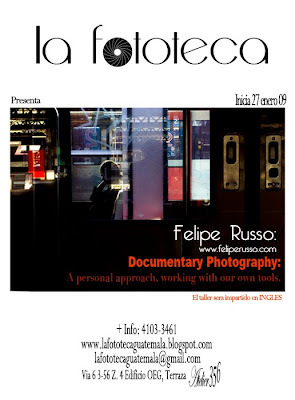 Felipe Russo is a photographer, founder of agency Amanajé Fotografia and a professor of history of photography at Panamericana Escola de Arte de Design em São Paulo, Brazil. At first Felipe studied Biology and Landscape Ecology. The photographer traveled to France where he studied photography at Speos-Paris- and was an intern t Magnum Photos. Now back to São Paulo, where he lives and works, he publishes in national and international publications while develops his personal projects. Now represented by the Galeria de babel www.galeriadebabel.com next to Alec Soth, Martin Parr, Luis Gonzales Palma and others.